(CHARLESTOWN, NEVIS–THURSDAY, APRIL 22, 2010) Premier of Nevis, the Hon. 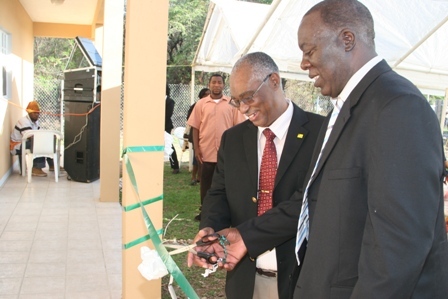 Joseph Parry described the opening of the Nevis Agro-processing Centre as a new beginning for the food industry in Nevis. He made the statement Tuesday at a ceremony to signal the official opening of the facility at Prospect. “The good thing is that in an age when we speak of moving away from chemicals, here we have a new beginning when we can get the people of Nevis to eat local, eat Nevisian and eat healthy,” said Premier Parry. 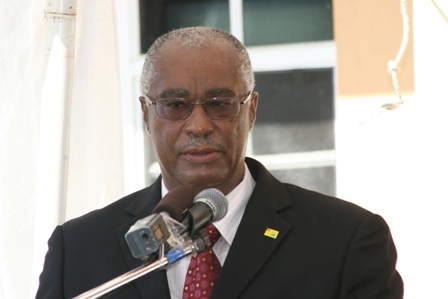 Mr. Parry made an appeal to the farmers and the people of Nevis to refrain from petty arguments about who brought the plant to Nevis but to simply use the plant and help develop the agricultural industry on Nevis. “Let us make a move forward to eat better. Let the planters use this as an assertive effort to make their business grow and enrich this island with local agricultural goods. This government is pushing ahead with diversification and this is what we intend to do,” stated the Premier. 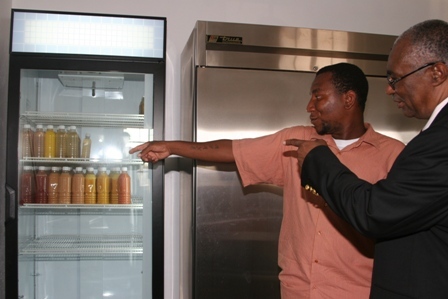 As he spoke of diversification and its importance to the development of Nevis, the Premier said the government had called on farmers and agro-processors to use the plant as a mechanism for growth. “We have been speaking of diversification in tourism and geothermal energy. Sometimes people seem to feel that by doing a second thing, one should abandon the first thing but diversification means you are doing a number of things at the same time and they each compliment and support each other. If one fails, the country will continue to survive,” he said. According to the Premier, the Nevis Reformation Party-led Administration was filled with achievers, leaders and thinkers and he said there is a need to appreciate the deeds of the government as it demonstrated work and performance. He added that the Nevis Island Administration (NIA) under his leadership had not only talked the talk but walked the walk. 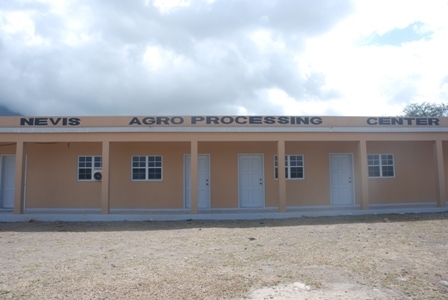 Meanwhile, the Permanent Secretary of Agriculture, Dr. Kelvin Daly said the cost of the plant was just over EC$600,000 and much of the finance came from the NIA. He also noted that some grants for the completion of the plant were also forthcoming from the Caribbean Food and Nutritional Institute and the Canadian Fund. According to Dr. Daley, the plant was outfitted with a processing room, laboratory, refrigeration room, bathrooms, an administrative office and a general receiving room. Communication Officer in the Ministry of Agriculture Mr. Eric Evelyn, who chaired the event, said the supply of goods produced at the plant would be available for sale locally and through some marketing and planning, the Department also hoped to export the goods regionally.